Dr. Breunig offers acupuncture to her patients in conjunction with chiropractic treatment. What is acupuncture and how is it performed? Acupuncture is the insertion of very thin needles through the skin to promote the flow of Qi (pronounced "chee") in the body. Only sterile, disposable needles are used. 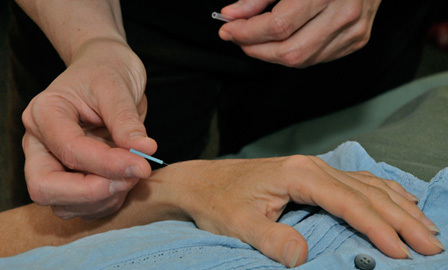 Dr. Breunig inserts the needles through the skin very quickly and there is little or no pain. Most patients experience pleasant relaxation during a treatment. Some feel especially energized after a treatment. Dr. Breunig specializes in treating nerve, muscle and bone conditions using acupuncture. She also offers acupuncture for those who are trying to quit smoking. How does she know where to put the needles? Dr. Breunig has studied the meridians, or channels, in the body. These meridians guide the flow of Qi in the body. Along these channels are various points. Inserting a needle into these points stimulates the flow of Qi along these meridians. The goal is to move the Qi, or energy, along the meridian and out of the body (for example, towards the foot or hand). Sometimes there is excess Qi, too little Qi, or Qi that is "stuck." Which techniques may be used to increase Qi? Dr. Breunig may suggest dietary changes, more sleep/rest, and strategies to reduce stress as ways to increase Qi. Stimulating a point or points helps to modify or eliminate a person's perception of pain, and to improve the way the body functions. "I've worked with Carla for the past 3 years since being involved in a motorcycle accident. I have appreciated her willingness to explore many different types of treatments for the deep tissue injuries in my hip, back and side from the accident. Acupuncture, massage, ultrasound, stretches, vitamins and chiropractic adjustments have all made a tremendous difference."